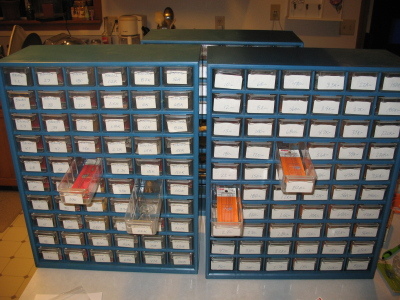 Last weekend, a coworker offloaded a truck-load of electronic componants to me -- resistors, capacitors, potentiometers, ICs, audio connectors, fuses, PCB boards, soldering equipment, etc., etc., as well as some circuitry books and schematic tutorials. I am now my own Radio Shack, as far as electronic componants are concerned. 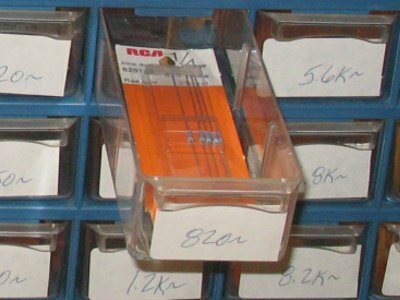 These two chests in front are full of resistors, ranging from less than 1 ohm to about 1 mega-ohm. The chest in the rear is full of capacitors and more resistors. I have another chest (not shown) that's full of fuses, and another one full of non-polarized capacitors, plus a giant cabinet full of miscellaneous ICs, diodes, and other things I haven't identified yet. Fun! It's like geek Christmas! and how much all that geek stuff run ya? It didn't cost me anything. He gave it all to me. He hadn't touched the stuff in years, and knew that I was into electronic tinkering. Seriously -- it is awesome. The guy told me that at his last count, this was a few thousand dollars worth of components.